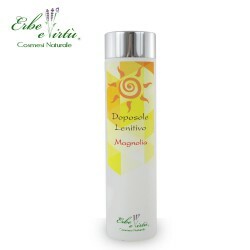 An after sun lotion that absorbs easily leaving the skin soft and hydrated. The special formulation with wheat proteins, almond oil and grape extract has anti-aging and antioxidant action. It fights free radicals preventing skin aging. Essential oils such as sweet orange and lemon essential oil work together with Licorice Root Extracts to calm and soothe skin redness while re-hydrating the skin. Collagen and hyaluronic acid regenerate the skin by returning the lost water giving an immediate feeling of relief. Vitamins that nourish and brighten the skin complete the formulation. Sweet Magnolia scent is released on the tanned skin. Wheat Protein, Sweet Almond Oil, Grape Extract, Sweet Orange Essential Oil, Lemon Essential Oil, Hyaluronic Acid, Collagen, Licorice Root Extract, Panthenol, Lactic Acid, Allantoin, Vitamin E, Vitamin C .
Apply on the parts of the body that have been exposed to the sun or U.V., massaging gently until completely absorbed. If necessary, repeat the application several times during the day.